Buddhism is all about training the mind, and boot camp is an ideal training method for this generation's short attention span. The chapters in this small book can be read in any order, and are simple and easy to understand. Each story, inspirational quote, and teaching offers mindfulness-enhancing techniques that anyone can relate to. You don't need to be a Buddhist to find the Buddha's teachings motivational. As the Dalai Lama says, "Don't try to use what you learn from Buddhism to be a Buddhist; use it to be a better whatever-you-already-are. "So whether it's Mother Teresa's acts of charity, Gandhi's perseverance, or your aunt Betty's calm demeanor, as long as you're motivated to be better today than you were yesterday, it doesn't matter who inspires you. Regardless of religion, geographical region, race, ethnicity, color, gender, sexual orientation, age, ability, flexibility, or vulnerability, if you do good you feel good, and if you do bad you feel bad. Buddhism isn't just about meditating. It's about rolling up your sleeves to relieve some of the suffering in the world. 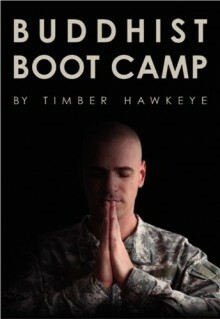 If you are ready to be a soldier of peace in the army of love, welcome to Buddhist Boot Camp!